Desire to attain a goal is key — but how do you make the commitment to achieve your goals? How do you control the activities and the information that’s related to your goals? How do you master the tools? At LightArrow, we understand that all the things you want to manage to achieve your goals can be very complex, and you can’t manage everything in a simple to-do list. Committing to using a systematic approach to productivity can reduce your feelings of being overwhelmed, stressed, or out of control. Keeping your commitment to personal organization can help you live a happier and healthier life. We’ve developed our app, LifeTopix, to assist you in mastering the art and science of personal organization. It manages all the information in your life — EVERYTHING — so you can get things done your own way in one place. Our app is based on the following: Capture, Know, Track, Connect, and Act. capture into a simple ‘bucket’ all of those things that are not on cruise control—anything that has your attention. LifeTopix lets you capture all of those things quickly by using Quick Add from the My Topics panel (your LifeTopix home base). You can capture Tasks, Notes, Appointments, Reminders, Bookmarks, Files, Audio, Photos, Videos, Checklists, Expenses, Projects, Events, Trips, Visitors, Service Providers, Assets, Log Forms, Activities, Nutrition, Health Stats, Medication, and Wellness items. You don’t need to capture all of these items or act on them right away, and they can be parked until you are ready to deal with them. Once you’ve captured all those things, the challenge is knowing what to do with them. Viewing those items in a high-level view, such as a calendar or project view helps you to understand the scope. It’s important to prioritize your tasks — paying attention to the important things and setting aside the not so important things. Prioritizing tasks by High, Medium, and Low makes sure you complete the highest priority tasks first. And perhaps some of the lower priority items can go into your “to-don’t” list if you don’t have the time to finish them. For example, maybe your goal is to declutter your house so you decide to participate in a neighborhood garage sale. 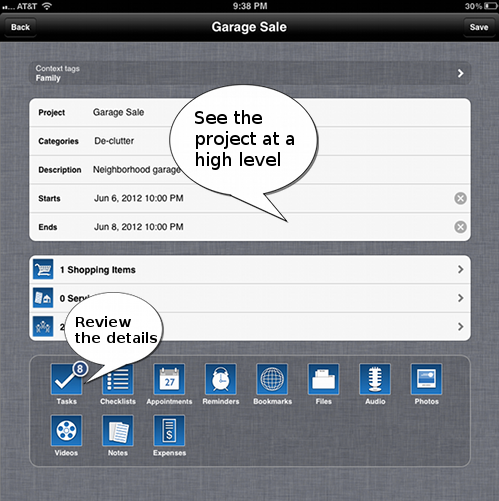 There’s lots of tasks that need to be completed in order to make sure your garage sale project is a success. Viewing those tasks in a Project View with prioritization of tasks can help you see the big picture and understand if this endeavor is manageable within your schedule. 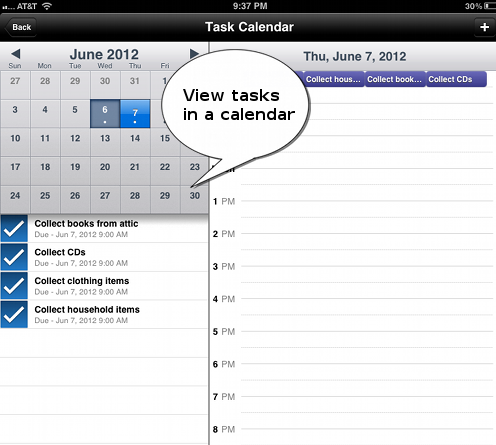 Viewing those tasks in a Calendar View shows you what’s next so you can act on the tasks appropriately. At the end of your day do you ever ask yourself, “where did the day go?” Do you feel that you were busy all day, yet you accomplished nothing? Does your spouse, partner, or manager ever question why you didn’t accomplish a task and you tell them that you just did not have time? Are they are skeptical? If you want to achieve your career, personal, or creative goals you need to gain awareness about where the hours are going. Face it, nobody can track all of the hours in their head, and you want to make sure you are spending the hours on something that that is important to you. According to Malcolm Gladwell in his book “Outliers: The Story of Success,” it takes 10,000 hours of pursuing something to become truly excellent at it. Consequently, achieving your goals takes a significant time commitment. This is why time tracking plays a powerful part in becoming productive and achieving your long-term goals. Essentially, using LifeTopix, all items that you capture are tracked. However, you can take full advantage of time tracking capabilities by marking items as Not Started, In Progress, On Hold, or Canceled. 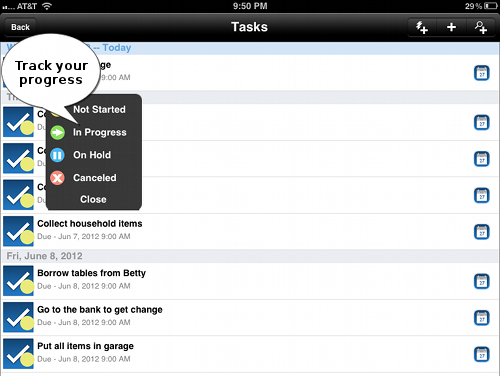 You can record the effort of each task, such as the hours required, and when the task was started and finished. The art and science of getting things done also means delegating tasks to others and exchanging ideas with others. How to delegate tasks and to whom is another subject altogether; however, the power of effective delegation cannot be ignored. Getting feedback and collaborating with others gives you the power of knowledge that nobody can possess solely on their own. LifeTopix includes features for easily delegating tasks to family, friends, or colleagues. It gives you the ability to assign owners to tasks and share those tasks via email, text message, Facebook, Twitter, Toodledo, or Google. Sharing via social networks gives you the ability to collaborate on a subject. For example, perhaps you want collaborate with your neighbors on the details of the neighborhood garage sale. No plan can be well executed without it having actionable items such as tasks, checklists, and appointments. Once you captured your items, you can decide if spending the time and energy on your current projects, tasks, and other items will produce a payoff. As you act upon these items and note your completion, you will recognize the self-esteem and confidence that results from your accomplishments. At LightArrow, we’d love to hear how you’ve used a systematic approach to achieving your long-term goals and how the power of productivity has changed your life for the better.